If you’ve read any amount of SleepBetter articles, you know that we always say the average person needs between seven and nine hours of sleep. The reason for that wide range is a wide difference in people. Some are fine with seven, while some need nine or else they’re tired all day. Never before, however, have the experts said the minimum you can get and still be healthy. It turns out that number is seven. The recommendation was developed by a panel of 15 sleep medicine experts, who spent spent 12 months evaluating the existing research. They found that while most experts say eight hours is optimal, there doesn’t appear to be a negative impact from getting just seven. 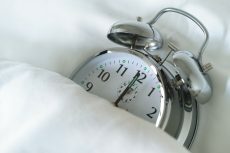 They also found that while there isn’t anything negative about getting more than eight hours of shuteye per night, if you find that you need more than nine, you should discuss the issue with a physician. If your bedroom is overly noisy, it may be good to invest in a white noise machine that can block that noise out. If your pillow is more than 18 months old, it’s time to invest in a new one. Older pillows lose their supportive properties. Be sure to shop for the right type of pillow as well. For instance, individuals who sleep on their sides need a higher pillow to support the neck. For a look at different types of pillows, check out Recommended Products page. If your bed partner is keeping you awake with snoring, an incompatible schedule, or restless leg syndrome (RLS), consider separate beds. It may not sound romantic, but neither is sleep deprivation.